Using them safely and confidently? Knowing whether to use topically, internally, with or without a carrier? Essential oils are the potent extracts from plants, and they not only have aromatic properties, they have health properties that can help us with our immune system, to fighting off disease and illness, to helping digestion, to many, many common ailments. They're a gift from God! 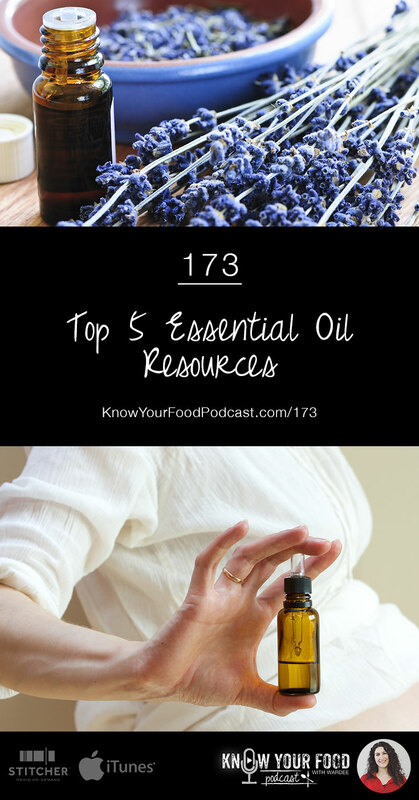 Today I'm sharing my top 5 essential oil resources… share yours in the comments! Don't have time to listen or watch? The complete transcript is below, too. Hi everyone! Welcome to Know Your Food with Wardee podcast. This is episode 173. A big warm welcome to my live audience and those of you who are checking this out later via iTunes or the blog, knowyourfoodpodcast.com. When this is released — it's not released quite yet as our live audience knows — then the show notes are available for you at knowyourfoodpodcast.com/173. That will be about the second week of August. If you're listening to this now on your earbuds or the video replay, that's at traditionalcookingschool.com. You could switch to either version, you could also go to the show notes, knowyourfoodpodcast.com/173. So as as we begin this podcast, I want to give an invitation to live listeners on Facebook live, to share; and if you're on Periscope, you can leave hearts. Either platform you can comment. Love to hear your comments as we discuss resources for essential oils. This should make for a great episode. All right, so we're talking about the best essential oil resources, and I have 5 to share with you. It's not exhaustive, it's just the things that I turn to over and over again. As my family and I are learning about essential oil, using them, it's a lifelong journey. Even though we've had essential oils in our home for a number of years, we're always learning new things, and as I said the other day on another broadcast, feel like we're just barely scratching the surface. It's a really fun journey, and as you all know, essential oils are kind of the rage these days; they're touted as the answer to everything. And while I don't believe that's completely true, I do believe they are a gift from God. They're the potent extracts from plants, and they not only have aromatic properties, but they have health properties that can help us with our immune system: to fighting off disease and illness, to helping digestion, to many, many common ailments. And as we embarked on that journey — I think a lot of you here are on that journey with me — it's really important that we find information that we can trust. That's why I'm coming to you today. To share with you my top essential oil resources, so that we can do the best we can for our families. We are all responsible for our families. And there's nobody telling us what to do. It's on our shoulders to research and figure out what we're going to do when this or that comes up. I hope that you find this list that I'm gonna share today helpful for you, as your families are doing similar things to ours, which is, something comes up and you want to find a natural remedy, right? Essential oils are so much of the time, the remedy that comes up. Not the only one, it's another tool in our natural medicine cabinet. All right, so I am going to share our favorite essential oil resources with you. The first one is a book. It's not an expensive book. And I have a link for you with the show notes, knowyourfoodpodcast.com/173. I hear that there's gonna be a new edition of this book coming out. In fact, I don't just hear it, I know it because my daughter has preordered it. But I have the existing version. The Complete Book of Essential Oils and Aromatherapy. It's by Valerie Ann Wormwood. I turn to this again and again. Any time something comes up, I go to this book and I look it up. It goes through all kinds of ailments. You can find out what's recommended and how to use it, and 99% of the time, we experience great results. The other one percent of the time is probably because it's just not quite the right remedy, or user error, or something like that. It seems to be spot on a lot of the time. So that is really the resource that I refer to when things come up on the spot. I look them up there. Now we do have some little booklets and things that have been given us. I've been gifted a lot of oils, and I'm very thankful for that. I've actually accumulated some different brands of oils and often when I'm given a gift set of oils, there will be a little booklet or something that comes along with it. Well, I keep those, because they're just another thing to refer to. While this one is my go-to source, I do often look up remedies in the little booklets that come with different oil brands, because they're helpful too. So that was number 1. The Complete Book of Essential Oils and Aromatherapy. Valerie Ann Wormwood. And for those of you listening to this later on iTunes, or through the blog, the link will be at the show notes, but otherwise you can search for it on Amazon. Look at the new version as well, that's available for pre-order. Now some of these are free and some of these are not, and I think you, like me, realize that there's people doing great work in whatever field we're interested in learning. So, if we're really interested in learning it, and somebody has paved the way with a lot of research, a lot of work, a lot of time and energy putting together things, then often, if that's what we really want to know, it's worth considering making the investment. I'm not coming to you saying you know, these are my top free essential oil resources. They're not. Some of them are, some of them aren't. But if we're interested in learning, I think we at least need to consider that making an investment of money would be worth it. So, having said that, my next resource is an online site for learning. It's called Vintage Remedies. 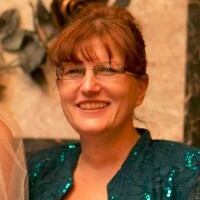 Vintage Remedies is run by Jessie Hawkins. The link for you to check out the courses is http://tradcookschool.com/vintageremedies. They're really good, they're not branded, they're unbiased, there's deep research, a lot of information. Pretty short courses, like the one that I looked up today on aromatics, which also — I think it's called Aromatics or Simply Aromatics or something like that — covers internal use of oils. It's just like six weeks of very thorough, efficient lessons to give you a really good essential oil education. I have gone through, in the past, a very good basics course on herbs and oils. Those of you who purchased the recent — I can't remember if it was the recent Healthy Living bundle or if it was the recent herbs and oils bundle — but you would have access to that same course like I do. Anyway, tradcookschool.com/vintageremedies is excellent essential oil education. If you, like me, are interested in taking your learning further, from a really good source, consider Vintage Remedies. Tammy is saying she really liked the Vintage Remedies courses too. Great, me too. Next is Rocky Mountain Oils. Now I bring them up not only because they're my chosen source of purchasing oils, tradcookschool.com/oils, but I bring them up because they have some great educational articles at their site. A recent one I read about essential oils with kids. It had great information. A link to that for you is tradcookschool.com/oilskids. You could peruse their site, and they have a lot of educational, wonderful articles. Now, because this comes up the last month or so as I've been mentioning Rocky Mountain Oils, people say ‘why do you like them,' ‘what's the big deal,' ‘never heard of them.' Well, I just wanted to do a really quick blurb on why I like Rocky Mountain Oils. Number one, the oils are quality. And that's another topic, for another day. But in looking into them, I feel their oils are quality. tradcookschool.com/oils, Rocky Mountain Oils. So the oils are quality. Another thing that's a really big deal to me is that the oils are affordable. There is no middle man. I don't have anything against the organizations that sell essential oils, we probably have listeners in here who are part of some of those organizations. But you pay a higher price, because you're not going directly to the company and ordering right from them. There's other people on the chain that are making money off your purchase. So, I like Rocky Mountain Oils because they're affordable because you're buying right from them. Also, you don't have any monthly minimums to meet, which is what the case is if you're part of an organization, from what I understand. With Rocky Mountain Oils, you purchase what you want, when you want, you don't have to commit to a certain amount of money. So, you're not only saving money overall, since the oils are less expensive, but you're not having to commit to purchases that you don't really need. And again, I don't have anything against the organizations that are out there. This is just my perspective and some of the things that were important to me when our family was choosing a company from which we want to get our oils. We wanted to get quality, and I just looked for affordability, and I also looked for the fact that I didn't have to be part of an organization or meet any monthly minimums. Again, totally my take on it. The reason I brought them up is because of their articles. I have spent lots of time reading at their site, and I encourage you to do that as well. TradCookSchool.com/oils is the link for you to check it out. You'll also find that link at the show notes. Number four is actually a resource that we have at Traditional Cooking School. It is a free resource. This was put together by Lindsey, who is one of our writers. It's an article. The link is tradcookschool.com/oilproperties. It's the Ultimate Guide to Essential Oil Properties, aka which oils do what. Lindsey has the article organized by properties; like digestive, analgesic, you know, any effect or benefit you might want to have on your body, it's listed in alphabetical order in this post. Then it gives you specific suggestions of which oils can help with those remedies. We're not claiming to be a replacement for the book I mentioned in number 1, The Complete Book of Essential Oils and Aromatherapy, but it is a starting place. A pretty exhaustive guide that you could refer to. I encourage you to bookmark it. It's tradcookschool.com/oilproperties. The reason we put this together is because we felt that essential oils could be tricky for beginners. Like there are oils that need carriers, there are oils that don't, oils that are safe for children, oils that are safe for internal use, oils that are not. So, we wanted to put together a blog post that was readily available, anybody could check out, as sort of a one stop, or at least starting place guide to understanding and decoding the various properties of essential oils. I encourage you to bookmark it. Refer to it again and again, share it with your friends. It's tradcookschool.com/oilproperties. Again, links will be in the show notes. All right, the fifth resource I have for you… This is a free one as well. It's upcoming, so it's timely. It's in August, coming up in August 2016, but if you are listening to this podcast, later and afterward, you can still follow this link because there's still a way to take advantage, although the free way is probably over by then. It's an online conference coming up in August. It's called The Essential Oils Revolution 2. The reason it is ‘2' is because they had one back in 2015. It was such a huge success. 165,000 people attended and clamored for more. So, the host, Doctor Eric Z, who is a friend of Traditional Cooking School, decided to do it again. So he's hosting it again. There are dozens of talks. There's aromatherapy, medicine, research, in-depth discussion, debunking myths, all kinds of talk about health conditions and how essential oils can help. I myself am giving a talk. It's not on health, it's on practical tips for using essential oils in your cooking, if you've decided that that is a use that you feel comfortable with. I'm sharing some practical tips about how to do it safely, how to store them, which oils are good for that, etc. So, let me give you a link for that. Tradcookschool.com/eosummit is where you can sign up for that. It is a free resource. It will take place over the course of a week in August, and every day there will be five to seven talks that are available for free. Every morning they switch them out. They send you an email, you go and you can listen to one or all or none of the day's talks. Over the course of the week, every day there will be a new set of speakers. And you have 24 hours to listen to them for free. So, in the comfort of your home, in your pajamas. It's not like you have to travel somewhere, it's not like you have to dress up. You can have your kids around, you can be listening to it while you're cooking. It's a wonderful resource. I attended the last one, I was not a speaker. This time I'm a speaker. Again, talking about cooking with essential oils, and I'm planning to listen to a lot of the talks as well. So check that out, tradcookschool.com/eosummit. If somebody could type that in the comments, in Periscope and Facebook live, that would be great. For those of you listening on iTunes, please, visit the show notes, knowyourfoodpodcast.com/173 and you will have links to this and all the other resources mentioned. Again, the summit link is tradcookschool.com/eosummit. All right. I think that's it. Let's do a recap of my top 5 essential oil resources. #1 was The Complete Book of Essential Oils and Aromatherapy by Valerie Ann Wormwood, my go to, in-depth resource when anything comes up for which I want to find a natural remedy. I'll have the link for you at the show notes. #2 is any of Vintage Remedies eCourses on essential oils. Tradcookschool.com/vintageremedies. This is a paid resource but well worth it. #3 is Rocky Mountain Oils, our preferred source of purchasing oils. Tradcookschool.com/oils. They also have great, free educational articles at their site. Tradcookschool.com/oils to read more about them. #4 is our own guide at Traditional Cooking School, the Ultimate Guide to Essential Oil Properties. Tradcookschool.com/oilproperties. It's a pretty cool list so bookmark it. And #5 is the upcoming FREE Essential Oils Revolution 2 online conference that I really hope you attend. Hope to see you there, or at least listen to my talk. I'm gonna give you the link. Tradcookschool.com/eosummit. I have been putting together a one page document, I'm calling it a cheat sheet, where it lists how to store your oils, which oils can be used for cooking, which oils can't be used for cooking, how to use the oils in cooking, and I put it all together in a one page download. It will be free. I'm giving it away with my talk. I will give it away later but for now the only place you can get it is through the summit, so, tradcookschool.com/eosummit. Make sure to at least attend my talk, because I'll give you a download link during the talk. Tradcookschool.com/eosummit. There's a little teaser and another little urge, another little prick to get you over there and take advantage of a great education. All right. Well, thank you so much everybody for being here. God bless you, and remember you can check out the show notes, tradcookschool.com/173. Bye-bye! FREE Essential Oils Revolution 2 online conference — see you there in August! Have you given Elizabeth Van Buren essential oils a try? They are beyond exceptional and tested multiple times before shipping. With all of the oils I’ve tried, and I’ve tried a lot, they are at the top of my list.